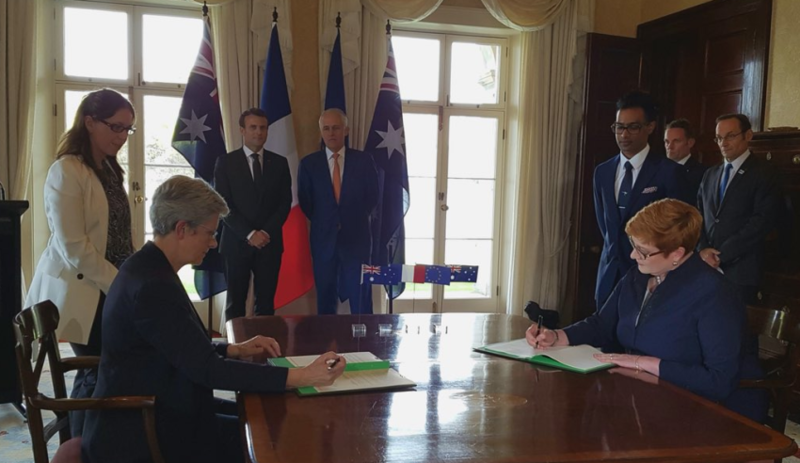 Minister for Defence Senator Marise Payne and French Assistant Minister for Defense Genevieve Darrieussecq have signed a Mutual Logistics Support Agreement (MLSA) between the nations. The MLSA will aim to improve the Australian Defence Force (ADF) and French Armed Forces combined operations by enabling mutual access to logistics services, resources and logistics training. "This signing reflects the deepening of the defence relationship between Australia and France, which will aid practical co-operation between our defence forces," Minister Payne said. "We conduct vital humanitarian assistance and disaster relief training with the French, including through the upcoming Exercise Croix du Sud, and this treaty will improve our ability to work together in response to events in the South Pacific." The signing occurred following the official bilateral meeting between Prime Minister of Australia Malcolm Turnbull, and the President of France, Emmanuel Macron. Minister Payne also attended a Commemoration Ceremony where Prime Minister Turnbull and President Macron laid a wreath at the Hyde Park ANZAC Memorial to honour the shared sacrifice of both nations during times of war. "Only last week, I was honoured to be in France for the ANZAC Day ceremony at Villers-Bretonneux to mark 100 years since one of Australia’s greatest victories and pay tribute to the shared sacrifice of France and Australia, and our allies, in the trenches of the Western Front," Minister Payne said. "It is a fitting tribute to this camaraderie and bond, that one hundred years later, the men and women of the Australian Defence Force and the French Armed Forces continue to work together to address global security challenges."